Alpha King | 3 Floyds Brewing Co. I had this on draught at a pub in Cincinnati. 16 oz. pour served in a pint glass. It pours a beautiful, rich amber with a finger of light beige head and thick lacing that coated the glass and never dissipated. It's a very attractive pour. The nose features grapefruit, caramel malt, pine needles, and floral hops. It's a pleasing - but not overwhelming - aroma. The taste is magnificent: a solid base of caramel malt and some subtle sweet fruit notes balance the pine and earthy hops. The favors compliment each other very well. This ale is medium-bodied and fairly creamy with pleasant carbonation and is easily drinkable with a temperate ABV of 6.66% Overall, this is a stellar APA that absolutely merits its lofty rating. I'm very pleased to have finally experienced this gem of a beer. Loving my malts, I'm braced for this beer. 68 IBU is above my tolerance level and.... I like it. As brewers tell us, it is hard for the malts to balance with lots of hops. This one does. I'm glad it does. In fact, it is such a pleasurable ale, that I don't mind being wrong. I since have pledged to buy a six pack for every summer. And if I can't get around to finishing it, I give it as presents. The giving makes up for the rest of my personality. And the reminder that 68 is not too bitter is a good lesson as I approach that age. Pours a deep, clear orange color with a hefty off-white head that lasts forever. The smell seemed a little muted to me, but caramel sweetness, copious citrus with orange and grapefruit. Malty, sweet, a bit of yeast, and I think I can smell peach or apricot. The flavor and feel are hard to separate. This beer is luxuriously smooth in the mouth feel and the flavors are incredibly well-blended. Obvious grapefruit, some pine, orange. Caramel sweetness. Very mild bitterness, slightly dry, carbonation is on the money. Just a small taste of peppery spice that cleans things up nicely and leaves a nice, lingering taste. This is a fantastic drinking beer, recommended, and I would enjoy it again, no doubt. Slightly hazy orange-gold, almost copper, with a pale toffee-colored cap that is somewhat stiff and resembles softly beaten egg whites. The crown has good staying power and deposits quite a bit of lace in thick rings and sheets. The nose is citrusy hoppy. Not overpowering, not the 'olfactory bomb' that is Stone IPA. The flavor has a citrusy hop bite, but there's also plenty of malt to balance things out. Flavors include grapefruit and orange peel primarily. Delicious. The mouthfeel is plenty smooth, no complaints here. Drinkability is high... nice and smooth, very well-balanced. Alpha King does seem more like an IPA than a true pale ale. I could definitely make this a regular in my rotation if it was more available. I plan to pick up a couple of fresh sixers (at the brewery) next week. Awesome Pale Ale! Definitely agree with the citrus hoppiness and caramel sweetness. Had hints of grapefruit, such a solid brew! I'm happy to be able to get this through ordering online at The Beer Temple! Presentation: 12 oz brown long neck with no freshness date to be found. Appearance: Dark amberish orange with an awesome off white head ... rocky, dense and sticky all over. Smell: Lots of citrius and a sweet floral aroma. Clean in the nose with hints of malt and fruity esters also. Taste: Medium bodied with a slightly chewy and textured mouth feel, nice mellow malt flavour holds up to a huge pile of juicy citric hop. Hop bitterness is great ... not too much though enough bite to be assertive. Mild fruity esters and a faint caramel malt are in the backround. Lots more hop flavour in the finish, slowly fading and letting a lightly toasted malt taste through. Notes: Well built and one of the best ales in the US. Hop character is above the rest ... a must buy. Look - copper and almost red. Not much foam. Some lace. Aroma - orange, grapefruit, resin, mild earth and a touch of floral. Taste - orange, grapefruit and caramel malt. It tastes quite a bit better than the description. The sweetness of the malt is balanced nicely by the hops. Feel - Medium-full body. The smooth and somewhat sticky malt coats the throat. Long and very pleasant hop finish that never gets rough. This is a quality many recent hoppy beers lack. Overall - a very good beer. My only complaint is this beer is nearly red and should not be considered a pale ale. Who cares? My rating would be the same if it was in the Amber category. poured a deep copper color with respectable head. Smell is very hoppy, also noted is citrus with lemon domibating. Taste is hoppy, hoppy, hoppy. There is also found some sweet malty notes that mox well with the hops. Finish is dry and bitter, but moderated some by the malt. An excellent all around beer. Brought back by my amazing girlfriend a couple weeks ago after visiting her parents in Indiana. Let's hope it's still fresh. Poured from a 12 oz. bottle into a shaker pint. Gold with just the slightest hue of red and a finger of frothy nearly-white head with decent retention. Ample but not particularly sticky lacing. Yup, this is still fresh. Initial aroma is mostly grapefruit and other citrus along with a slight hint of pine. Slight caramelized malts providing just a bit of balance. When this first hits your mouth, it's significantly less bitter than the nose would lead you to believe. Slightly sweet grapefruit followed by a hint of floral hops. Reasonable amount of toffee/brown sugar/bready malts, although (as expected from a pale) the hops continue to dominate. Nice, dry finish. Every sip is a massive bouquet of flavors, this thing is very complicated. Slightly chewy and with moderate carbonation. Very silky and smooth mouthfeel. All in all, this could easily be one of my new favorites. I'm pretty glad 3F doesn't distribute in my state because this could be dangerous. Oh well, it might be a good excuse, after eight months, to visit the girlfriend's family. Two thumbs up. My big toes, too. Got this as an extra on a trade I think. This is the first beer I have had from Three Floyds and it did not disappoint. Pours a dark redish orange color with a moderate head that faded to a faint layer of bubbles that rested on the top of the beer. Smelled of sweet citrus/floral hops with some bready malt smells in there too. Taste was awesome, sweet, citrusy, grassy hops, sharp bitter hop finish. Medium bodied. Very drinkable. Awesome beer. 12 ounce bottle recieved in a trade, poured into a pint glass. A vigorous pour produced a 3 finger fluffy khaki cap, that has some staying power. Lacing collects on the side, nice. The aroma is nice and sweet, candy like fruitiness, bready, as the beer warms up light hints of caramel and butterscotch. I would have liked more hop aroma too come through. The taste starts with good sweetness and finishes with firm bitterness that lingers. Piney, cirtusy hops. I could taste a little tangerine with a grapefruit bitterness on the finish. This is one of the hoppiest pale ales I have ever had. It's really good, nice mix between the hops and malt, with a slight edge going to the hops. Mouthfeel is good, silky smooth, full mouthfeel. No complaints here. The drinkability of theses pale is outstanding. I wish I had more of these and I could easily see myself drinking a 6er of these in a night, if I had regular access to this beer. I had trouble not drinking this too fast while trying to take tasting notes. Get some! 12 oz bottle poured into my sweet new Notre Dame bulbed pint glass (from the university). Nice Amber, close to copper color in the liquid and has excellent clarity. Orange/vanilla colored head with some pretty nice lacing to it. Smells pretty good. This is an aggressively hoppy pale ale but you can tell it's well balanced and actually sweet smelling as well like fresh baked crusty bread with honey and butter then smacked with some citrus type hops. Taste is on par with the smell Maybe a little better I'd grade it like a 4.15/5 if I could. Same sweet malty tones providing the same bread/honey flavors I mentioned before in the aroma. Good citrus and sea bit of sappy pine; well balanced. Mouthfeel is probably the best part. Medium body with an ad adequate carbonation level. Balance of sweetness and bitterness is really good balance is the key word here. Great drinkability, really smooth with a slightly bitter finish. Great anytime beer. A little expensive for my liking but worth a try. This beer pours a dark golden color, with a good size head that lasted through out the beer. There is a strong hoppy and grapfruit aroma. There is a strong hoppy taste, but it lacks that bite that some pale ales have, also a bitter grapefruit like taste is detectable. Not very carbonated and could use some more carbonation. Overall a REALLLY good beer, I enjoyed this one. Big ups to smchenry75 for this extra! A - a deep auburn rust color that is transparent with a thin film on top and ring around the edges showing ok retention. A - this is one of the most aromatic brews for the style i've come across, big pineapple, mango, nice clean malt backbone. T - big hop presence, resiny, sappy, transition to the sweet mango and dry bitter grapefruit, the malt shows and is subtle and clean, i can tell this is not at its peak but is still very good i would love to get this at 2 weeks old. actually able to pick up some slight ethenol. O - very good APA, dare i say that it reminds me of DR 11's little bro...i may have one tonight just to confirm or reject this thought. i would definitely get a keg of this as i said with gumball head. 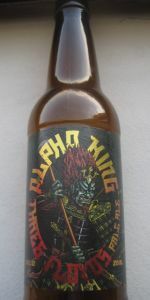 Alpha King from 3 Floyds Brewing Co.